I'm new to this forum (obviously). I appreciate all of the information you guys provide to each other. It's a wonderful wealth of knowledge for a subject on which not many people are sharing! So my issue today is that EV mode is not kicking in. At all. I've checked off the list of common causes, such as the defroster, the A/C, the outside temp (mid to low 90's Fahrenheit at the moment), and everything as far as that goes checked out. Defroster is not on. A/C is off. Outside temp is within operating range. The only thing I can figure is that it's the 12V Auxiliary Battery (passenger side under the hood). That being said, I called the dealership to ask them what the price would be to replace this item (since, apparently, it's not covered on the 10yr warranty and I'm out of my new car warranty). They're saying itS $700.00, plus tax and install, which would bring it to $800.00. I mean, seriously. That's absurd for a battery that's smaller even than a regular car's battery. I can't find ANY information on what battery would be a suitable replacement for it. Does anybody know? Any help would be much appreciated, as even the dealership was stumped about finding a model number I could shop for. tldr; Auxiliary 12v engine restart battery is expensive. Anybody know of a suitable replacement? Here is what I found for the hybrid. Sorry the image is small but it says. So if you do a google search for 55D23L is shows a lot of compatible batteries. Good luck. The "auxiliary battery" is NOT the one on the passenger side. The "engine restart battery" is the one you are looking for. The "auxiliary battery" is the one on the driver's side and is just a regular run-of-the-mill battery. Now that that is out of the way, I'm curious if you have any updates on this? Assuming the dealership was correctly interpreting what you were talking about, it seems odd that the engine restart battery would be quoted at $700 for just the part. Googling "N-55R battery" gave some results in the ~100 range on some weird foreign sites. I don't know how to determine what would be an equivalent replacement for it, but there must be something readily available out there. Start/Stop is a fairly common feature these days. $700 just seems absurd. The only reason I can guess for this not being covered is because globally-speaking, it is not exclusive to the hybrid. I believe in other countries, they do offer the start/stop functionality on non-hybrid models. That still seems like a stretch though... The warranty terms don't apply globally, they are market-specific. So since here in the US the start-stop battery is exclusive to the hybrid, it seems like it should be covered by the hybrid warranty. That's some BS as far as I'm concerned. Fortunately though, I'm still fairly confiend that having to pay for this out of pocket should not cost $700+tax and installation. Something seems wrong there. I'm very curious to find out how this all turned out. '15 XV Crosstrek Hybrid in "Plasma Green Pearl"
I too would like to know how this scenario turned out, we considered a Hybrid ( albeit briefly) before coming to our senses and purchasing our 2015 gas model. For anyone reading this that might be looking for a replacement for the $700 restart battery I seemed to have found a solution. If you read my thread you can see why I'm in this position but I basically determined that it wasn't the alternator but the restart battery. Very disappointing that Subaru wants around $800 for this battery but I went to the local Batteries Plus Bulbs store and they set me up. If readers are not familiar Batteries Plus is a nationwide chain that is expert in batteries and apparently light bulbs. you can even look at their website and order the battery to pick up in a store. they sold me the same battery for that they sell for the Prius. It was the exact same size as the one in my Subaru and the terminals were exact and everything. Best of all it was only $230 instead of $700 and it came with a 3 year warranty instead of a 1 year like the Subaru $700 special. I think it was the Duracell ultra AGM battery. Can you post the model of the battery for other members in the same position? Sure thing. It's SLI51PAGM, Duracell ultra, the format is BCI Group S46B24R. 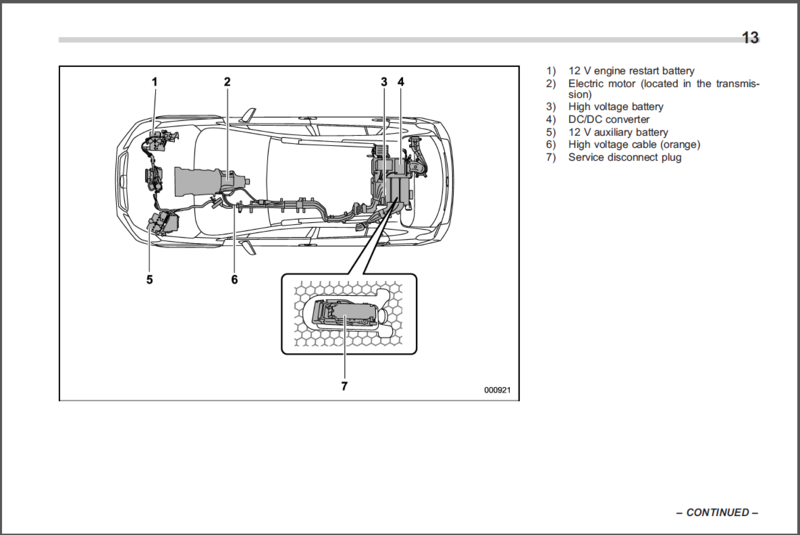 important to note is if you try to search the Batteries plus Bulbs website for a Crosstrek hybrid battery it doesn't come up. They just don't allow a search for the Crosstrek hybrid. and if you call them they'll say they don't have a restart battery for Crosstrek hybrids. But you can find the battery by searching for 2016 Toyota Prius and they give a 10 percent discount if you order on line for store pickup. rlouie, jamesxv and ridewhencan like this. I'm going to have to play with this when our weather gets nicer. Here's a shocking discovery....The stock Subaru Aux battery is only 380 CCA?? What the heck...No wonder my car has a tough time turning over the engine on a colder day.. If it's using the same battery as the gas version, then it should be 390 CCA. Since you have had the car for a few years, it's not how much the battery is rated at that matters now, it's how much it puts out that matters now. All batteries as they age will loose some CCA as well as capacity much of it depends on how the battery has been treated since it was new - ie. has it been through a deep discharge, physical damage due to a very rough ride or never maintained (even for most 'maintenance free' battery, maintenance is needed for long life)? Take the car in to almost any place that sells batteries and get a load test done to check how much CCA it has left. Can 2012 1.6 BC model use S model dashboard speakers? Auxiliary High and Low beams.